Texas A&M alum Lt. Col. Roy Tisdale died on June 28 during a safety briefing at Fort Bragg, N.C. Tisdale was killed by another soldier who then fatally shot himself. Tisdale had served in both Iraq and Afghanistan. In the days after the soldier's death, word spread that Westboro Baptist Church members were planning to protest Tisdale's funeral. Described as a "homophobic and anti-Semitic hate group" by the Anti-Defamation League, Westboro Baptist Church regularly stages protests around the country. According to KBTX.com, the group, which is based in Kansas, frequently targets military funerals because of "a belief that God punishes soldiers because of America's tolerance of gays." When Ryan Slezia, a former Texas A&M student, heard of the group's plans, he hatched a plot to foil their efforts. "In response to their signs of hate, we will wear maroon. In response to their mob anger, we will form a line, arm in arm. This is a silent vigil. A manifestation of our solidarity," he wrote on Facebook, inviting others to join him in a peaceful protest. 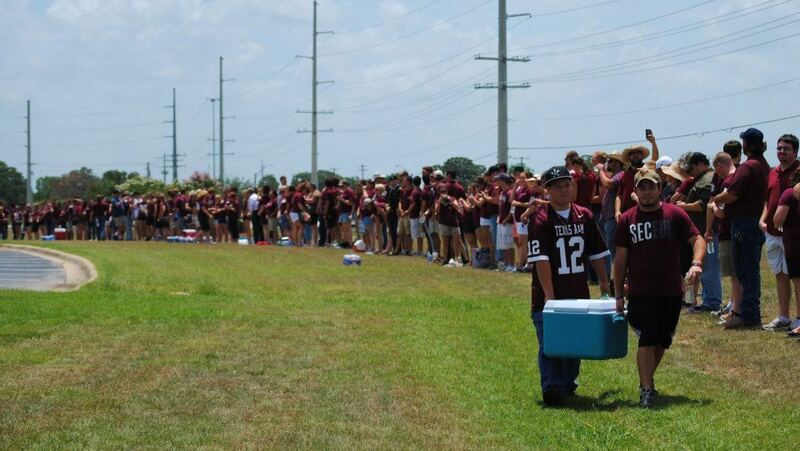 On Thursday, as Tisdale's funeral was held at the Central Baptist Church in College Station, Tex., hundreds of students and alumni responded to Slezia's invation, linking arms to create a human barricade surrounding the church's entrance. Most wore maroon -- A&M's school color. One participant tweeted that over 650 people showed up, creating a formidable "maroon wall." “We are standing here quietly. We are here for the family,” Lilly McAlister, a Texas A&M student, told KBTX.com. "We are positioned with our backs to them. Everyone has been told there's no chanting, no singing, there's no yelling anything back." The hundreds gathered were prepared for a potentially aggressive confrontation, but the protestors from Westboro Baptist Church never showed up. Tisdale's body was peacefully laid to rest after the funeral at the Aggie Field of Honor -- a cemetery for Texas A&M students and staff. Correction: A previous version of this article incorrectly stated that Tisdale died during a training session.